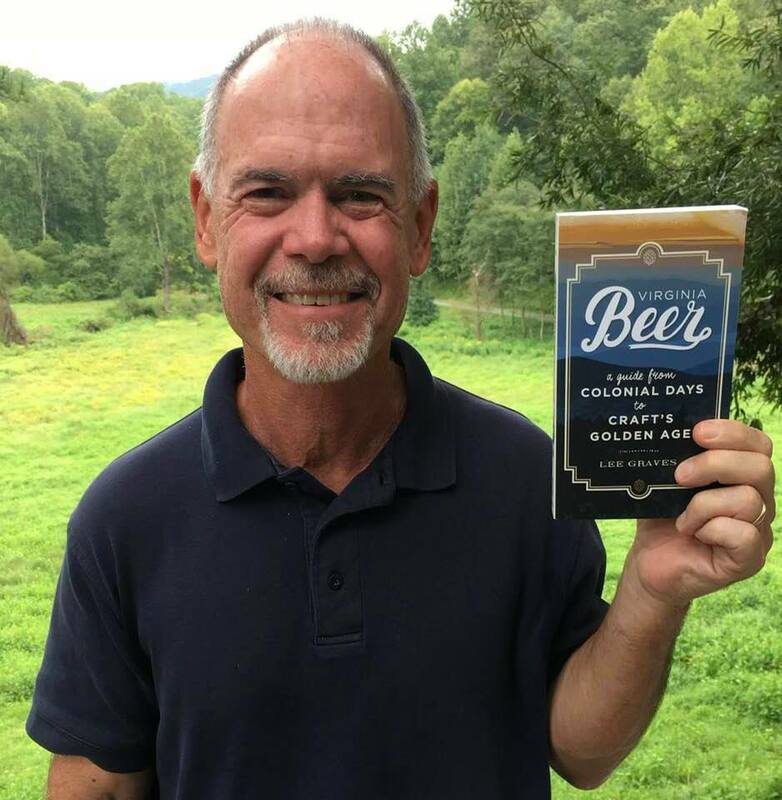 The history of brewing beer in the Commonwealth — the land of Washington, Jefferson and other notable Founding Fathers — comes to life in a well-researched book from writer Lee Graves titled Virginia Beer: A Guide from Colonial Days to Craft’s Golden Age. For Graves, the former RVA Beer Guy columnist for the Times-Dispatch and a frequent contributor to this magazine, the book is the third in a series that began with Richmond Beer: A History of Brewing in the River City (2014) and followed by Charlottesville Beer: Brewing in Jefferson’s Shadow (2017). The title of the new book provides an instant mental snapshot of it’s contents. Graves takes us on a complex and fascinating journey from Roanoke to Richmond, Charlottesville to Tidewater, Northern Virginia and Loudoun County. It reminds us of where and why it all began. He delves into the unexpected role of women and slaves in the brewing of beer, and that of newly arriving immigrants — from Europe. I recently caught up with Lee Graves to discuss his new work, which is to be released on October 2 to the public. Here’s our Q&A session. How does it feel to be Virginia’s Beer Historian? Ha! I wouldn’t know. I do find the “historian” tag being applied to me a lot now, which is an honor. But I’ve simply built on the work of Garrett Peck, Danny Morris, Tanya Birch, Annie Tobey and other fine writers. I think of myself more as a journalist who has followed his nose into interesting places, and the history of beer is loaded with great stories. I’m content with being just a Virginia Beer Guy. How much did your experience in researching and writing Richmond Beer and Charlottesville Beer help you in developing Virginia Beer? My first two books helped immensely by revving up my research and building on one another. With this new book, I was able to include high points of some of that history and expand on efforts elsewhere, such as John Mercer’s failed attempts at Marlborough in 1766, the importance of Robert Portner’s brewery in Alexandria in the late 1800s, the post-Prohibition efforts of Virginia Brewing Company in Roanoke and the advent of microbrewing in the state with Chesapeake Bay Brewing Company in Virginia Beach. As an overview, what are some of the key takeaways from the Commonwealth’s history with beer making? Virginia claims a unique place in the country’s beer history. The first English settlers brought beer with them in 1607, and brewing has been a constant ever since (even homebrewing during Prohibition). Virginia can trace its hop industry to the early 1600s and was the top hops producing state in the South up to the Civil War. The first canned beer in the world debuted in Richmond in 1935. Charlie Papazian, the “godfather” of the modern craft era, started homebrewing while a student at the University of Virginia. There’s plenty more! And we have such an incredible scene right now—it’s great! What did you find most interesting about Virginia’s past with regard to making beer? I’m fascinated by the roles of women and slaves in early Virginia brewing history. Women supervised brewing beer on plantations and improvised with numerous ingredients, everything from persimmons to corn stalks. Slaves grew hops in their own gardens and sold them to plantation owners and brewers for a profit—this occurred at Monticello, Mount Vernon, in Williamsburg and elsewhere. Plus I have immense admiration for Peter Hemings, Thomas Jefferson’s slave who was trained by a professional brewer at Monticello. Why is it important for both today’s craft brewers and enthusiasts/consumers to look at the industry from a historical perspective? Every time you hoist a glass of beer you are connecting with human history, back to the dawn of civilization. Plus so many beer styles have amazing histories. Drink a pilsner, and you’re instantly connected with 1842 and the birth of a beer style. Many of today’s brewers are exploring historic recipes to offer new interpretations of old beers, which is exciting. I think there’s a growing awareness of how the history of beer is part of a larger tapestry, our sense of culture and who we are as a society. What aspects and developments of today’s Craft Golden Age do you find most interesting and why? In my lifetime, the U.S. has gone from basically a one-trick pony—mainstream lagers—to the most diverse, interesting and creative brewing nation in the world. Old styles are being revived and new ones are evolving—IPAs are a great example of this. American brewers brought IPAs back to life, and now they dominate the market. Craft brewers honor tradition but are not handcuffed to it, and the emphasis on “taste of place”–on being local–invites exploration. Plus I love that tasting rooms have become community centers, where families and friends can share good times and flavorful beers. We have truly witnessed a cultural shift in that regard. Finally, craft breweries have been an economic engine and revitalized otherwise blighted urban areas. Where can folks purchase Virginia Beer: A Guide from Colonial Days to Craft’s Golden Age? It is available through University of Virginia Press, at bookstores, online and other familiar places. I hope that some of the breweries around the state will carry it in their taprooms. I also have nearly 20 book-signing events lined up this fall, if anybody wants to add my scrawl to the text (details at www.upress.virginia.edu/title/5068). Does your new Virginia Beer complete the series? Is there anything else to historically document from the past? I love history, and there’s plenty to dig into. I’ve been continuing to research Virginia’s hops history and the role of slaves in brewing and growing hops. I’m passionate about the latter because it’s largely an untold story and it’s an important and inspiring facet of African-American history. Whether this leads to another book, we’ll see!